California’s new vaccination law is arbitrary and messily implemented, says a group of six parents and four advocacy organizations that filed a lawsuit to stop the law last week. The law also violates both the state and the U.S. constitutions, the group said. 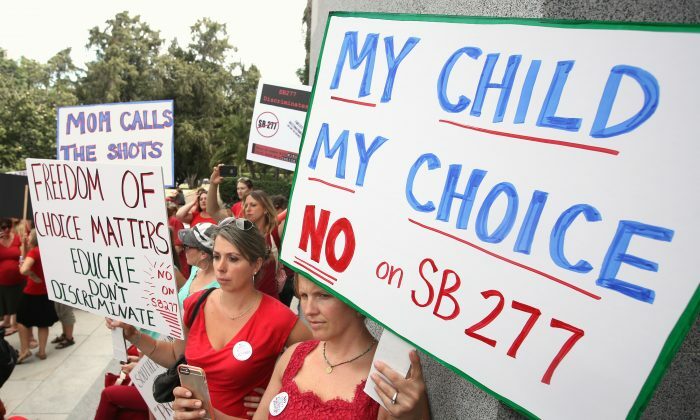 The law, called SB277, went into effect on July 1 and requires all children attending school to be vaccinated from about 10 diseases, when entering daycare, kindergarten, or seventh grade. It eliminates the previous exemption that allowed parents to refuse vaccines due to personal beliefs. The only exemptions are children with health reasons and those with special needs. If not exempted, unvaccinated children can’t attend school. They can still be home schooled. The lawsuit alleges the law is implemented in a way that violates children’s rights. For example, plaintiff Veronica Delgado alleged she was told her son, who received some, but not all the required vaccines, can’t return to school until he catches up on his vaccinations. But, she said, the child has special needs and thus should be allowed to attend school even if not vaccinated. But the Department of Education hasn’t given guidance to the schools regarding students with special needs, the lawsuit said. Thus, it alleges, the special needs cases are handled differently by different schools. “Because education is a fundamental interest under the California Constitution, this unequal, arbitrary treatment violates the equal protection provisions of the California Constitution,” the lawsuit reads. Also, at least one county’s Public Health Department started reviewing medical exemptions from vaccinations for “not meeting SB277 criteria,” the lawsuit states. “No law provides authority for California schools or administrative agencies to regulate medical exemptions, or to override the medical judgment of physicians,” the lawsuit states. The lawsuit also alleges the law violates the state constitution in and of itself. California Constitution allows laws to impact children’s right to education only if narrowly tailored to serve a compelling state interest. The lawsuit argues California vaccination rates exceed 95 percent, which is the threshold deemed enough to prevent the population as a whole safe. Such rates were achieved with the personal belief exemption in place and thus, the plaintiffs argue, the new law is arbitrary. The law’s proponents said there are “pockets” of population where the vaccination rate is under 95 percent. State Senators Richard Pan and Ben Allen introduced the legislation last year after a measles outbreak originating at the Disney theme parks in Anaheim left 136 people sick. Of the 136, 28 people were identified as intentionally not vaccinated for personal beliefs, according to the Centers for Disease Control and Prevention (CDC). The CDC didn’t list the vaccination status for the majority of the sick people, making it hard to directly link unvaccinated people to the outbreak. Also, 13 of the sick had at least one dose of the vaccine. The lawsuit also alleges that the law violates the U.S. Constitution by forcing parents to choose between education of their children and, among other rights, the freedom to exercise religion. One of the plaintiffs specifically mentioned a religious objection to vaccines that use aborted fetal cell lines in production. The lawsuit seeks injunction of the law, meaning suspending the law until the lawsuit is over.